AZO is an ideal replacement transparent conducting oxide (TCO) for ITO for all corresponding applications. Typical applications include: transparent electrodes for solar cells, flat panel displays, LCD electrodes, electro-magnetic compatibility (RF-EMI shielding) coatings, touch panel transparent contacts, static discharge dissipation, and IR windows. A substantial cost savings is possible with AZO materials as compared to ITO and other TCOs. The refractive indices for reactive magnetron sputtered AZO at 600 nm wavelength range from 1.90 ± 0.02. Pulsed DC magnetron sputter deposition of AZO produces an index ~2.00, comparable to DC magnetron sputtered and E-beamed IAD ITO. AZO is deposited by sputtering from targets composed of 2-4% Al metal incorporated in ZnO. Electrical conductance, measured as bulk resistivity or as sheet resistance, is related to deposition properties and thickness. Figure 1 presents the sheet resistances achieved for several DC magnetron depositions made with the Materion 2%/98% target on ambient-temperature glass substrates. Figure 2 shows the transmittance of the 733 nm thick (~100 Ω/sq) sample sputtered onto glass. Absorption begins just short of the 500 nm wavelength, and the film has high transmittance to ~1000 nm. No inhomogeneity in index is apparent. 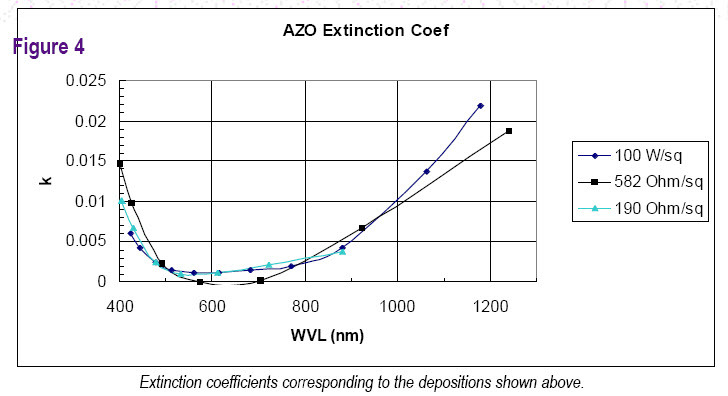 Figure 3 shows the optical properties of the films: their refractive indices and extinction coefficients. All depositions were made on substrates that were not intentionally heated. The refractive index is similar to that of ITO, but exhibits smaller wavelength dispersion in the visible region. Very low absorption appears in the visible region and at shorter and longer wavelengths. There is a small dependence of transmittance and absorption on thickness (sheet resistance). 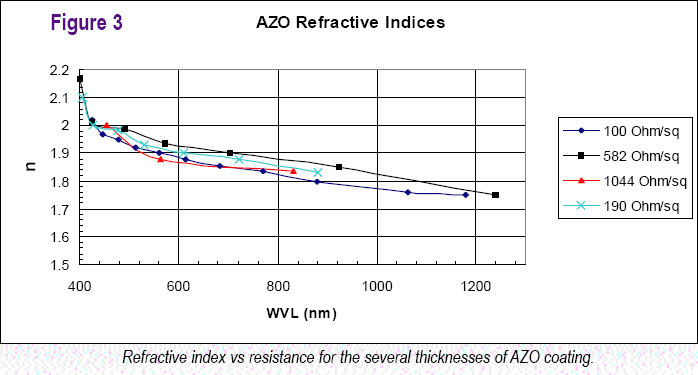 The table lists the optical constants for the 733 nm thick AZO layer deposited on glass; they should be considered guide values because different process parameters will produce slightly different results. Compared with the data for a layer on a silicon substrate, Figure 5, (different deposition), the visible indices are ~2% higher on the glass substrate. Spectroscopic ellipsometry of a 319 nm thick film of 440 Ω/sq sheet resistance deposited on silicon determined the index and extinction coefficients that are plotted in Figure 5. 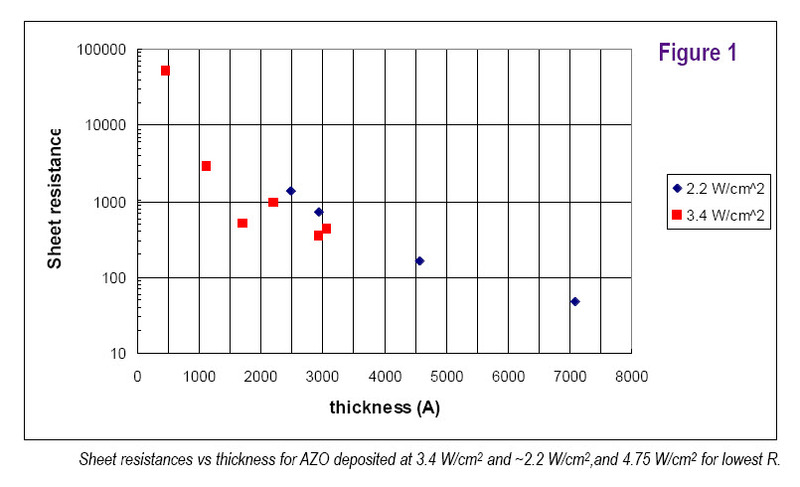 Subjecting the AZO layers deposited on glass or on Ge substrates to 20 eraser strokes at 2.5 lbs force produces no scratching or adhesion loss of the films (severe abrasion per MIL-STD C-48497). This result indicates that the films are hard and adherent, comparable to films of ITO. When boiled in D. I. water for 20 minutes, the films are insoluble and showed no changes to their durability properties, but index and extinction coefficient decreased (~-3%). 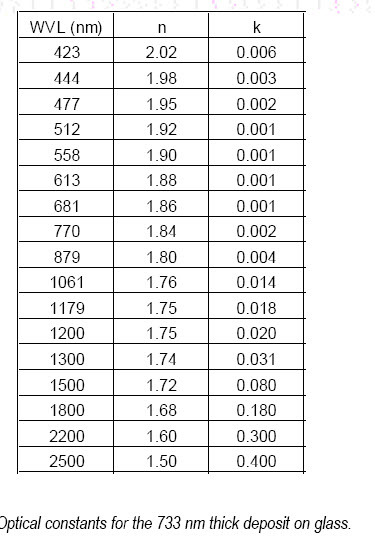 The sheet R increases for films thinner than ~300 nm. Films deposited on cool substrates exhibit a larger instability to post-deposition in air than films deposited on substrates near 300° C. These changes indicate that the film properties deposited on cold substrates are not stable until subjected to a short-time anneal in air at a temperature higher than deposition temperature. The higher temperature increases the oxidation of the AZO layer, and resistance. Deposition on substrates heated to high temperature (~200° C) increases the stability for subsequent high-temperature operation. High density: 95+%, hot-pressed, conductive. Reference 1: CERAC Coating Materials News, Vol 15, Issue 1, March 2005.